The Specification Manager is the central tool for working with requirements and provides a Word Processor or Spreadsheet like interface for entering, maintaining and viewing Requirements. New Requirements can be created with names and detailed descriptions and properties such as Status and Priority can be added from drop-down lists. 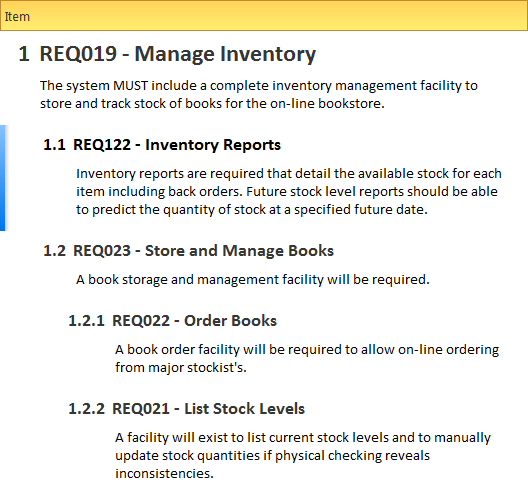 Existing Requirements can be viewed and managed in a convenient view and changing them in the Specification Manager will change them in all other places in the repository such as diagrams and windows. It is the perfect tool for those analysts more comfortable working with text rather than diagrams and who are accustomed to working in a Word Processor or Spreadsheet. It has the added advantage that the requirements are part of a model and can be traced to other elements including Business Drivers, Stakeholders and Solution Components. To create, view and maintain Requirements in a text based tool that resembles working in a word processor or spreadsheet. Details can be added to the requirements and requirement properties can be added from drop-down lists. When the requirements are changed in this Specification Manager the changes are conveniently reflected in the Project Browser and all other windows. 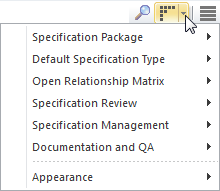 There are a wide range of options available from the options menu, to tailor the way you use the Specification Manager. These include Level (hierarchical) Numbering, Auto Naming, Spell Check, Documentation, Import and Export of Requirements, access to various related tools and more.